Avast! I found this in me mail at work. Do ya really think it be appropriate for developers t' be known as pirates? Arr! Some o' them code that way, but t' meticulous ones like me would hate t' be associated with a bunch o' scalawags. Download yer own map and game pieces here. Me only complaint be where be t' beauties (women)? You think all coders be men?!?! What is that? 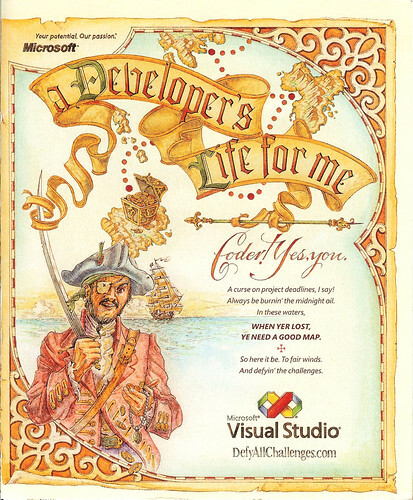 An ad for Visual Studio? Ummm...yeah, it's a little odd, comparing developers to pirates. Isn't that a little more hackerish? (don't hurt me! I'm just sayin!) I mean most coders get really miffy if you even use the word hack in their presence.